Shirley MacLean Beaty, known professionally as Shirley MacLaine, is an American film, television and theater actress, singer, dancer, activist and author. She has won the Golden Globe Award for Best Actress ? Motion Picture Musical or Comedy twice, for her roles in The Apartment and Irma la Douce, and the Golden Globe Award for Best Actress ? Motion Picture Drama twice for Terms of Endearment and Madame Sousatzka. She was honored with the Golden Globe Cecil B. DeMille Award in 1998. She was nominated for an Academy Award five times before winning the Academy Award for Best Actress in 1983 for her role as Aurora Greenway in Terms of Endearment. 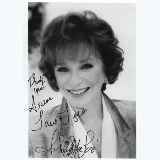 She won the 1976 Emmy Award for Outstanding Special ? Comedy-Variety or Music for Gypsy in My Soul in addition she has also won two BAFTA Awards from seven nominations. In 2012, she received the 40th AFI Life Achievement Award, the highest honor for a career in the US film industry, from the American Film Institute, and in 2013 received the Kennedy Center Honors for lifetime contributions to American culture through the performing arts. MacLaine's younger brother is actor Warren Beatty. There are discussions that this celebrity might use an autopen, pre-prints or secretary for at least some TTM autographs (You might find more info in the forum section).